DETROIT (Bloomberg) -- Ford Motor Co. had its corporate credit rating raised by Standard & Poor’s Ratings Service after the automaker reported its largest annual profit in 11 years. The rating was increased one level to BB- from B+, S&P said in a statement on Tuesday. The rating is three levels below investment grade. The outlook on the rating is positive, S&P said. Ford reduced its automotive debt, which excludes Ford Motor Credit, by 43 percent to $19.1 billion at the end of 2010 from a year earlier. The company’s rating may be raised again within 12 months if the global economic recovery continues, its performance improves and it reaches a favorable resolution to its contract talks with the UAW, S&P said. 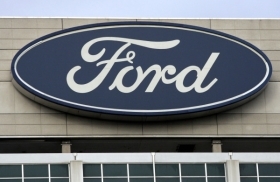 Earlier Tuesday, Ford said its U.S. sales rose 9.2 percent in January. Last week, Ford reported 2010 net income of $6.56 billion, the most since 1999.